A couple of weeks ago our family went on what was one of my most favorite weekend getaways ever. We loaded up and headed to Vancouver Island on Friday to visit Tara and her family, who live on the south end of the island. This trip was a very, very long time in the making. The biggest hurdle was that for literally YEARS I was hung up trying to get the documents I needed to get my girls' passports. Finally last summer we secured our passports and then FINALLY the trip came together in March. Matt, the girls and I set off on Friday morning to drive north to the U.S./Canada border. It was a lovely drive, the border crossing was very easy. 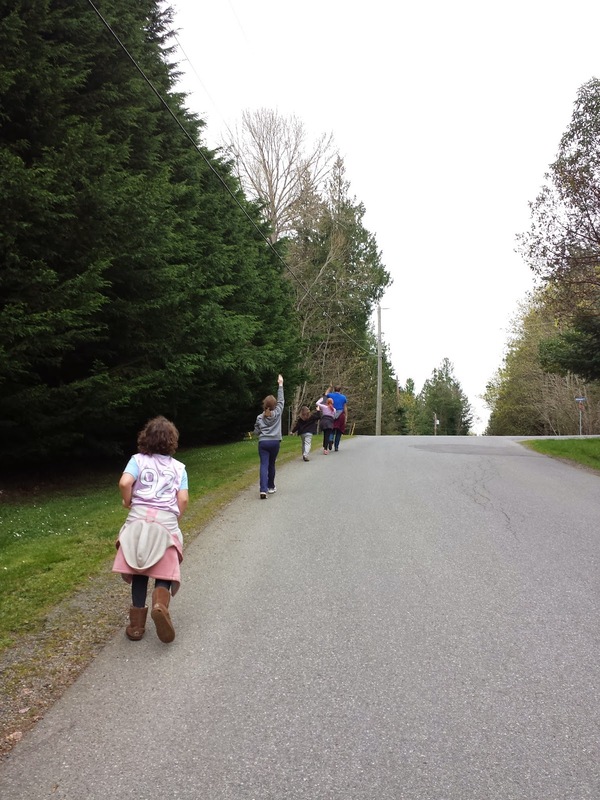 Then we had to get to the B.C. 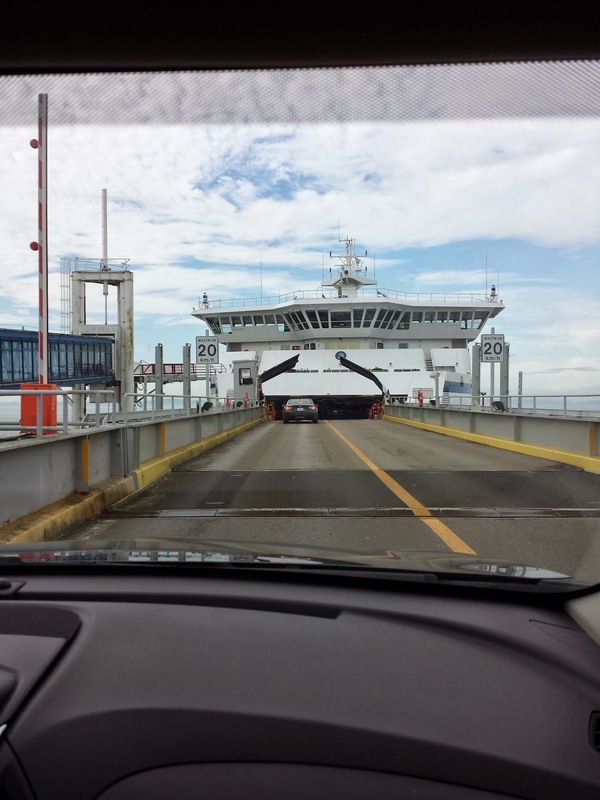 Ferries terminal and board a giant boat for the 95 minute sail to Vancouver Island. 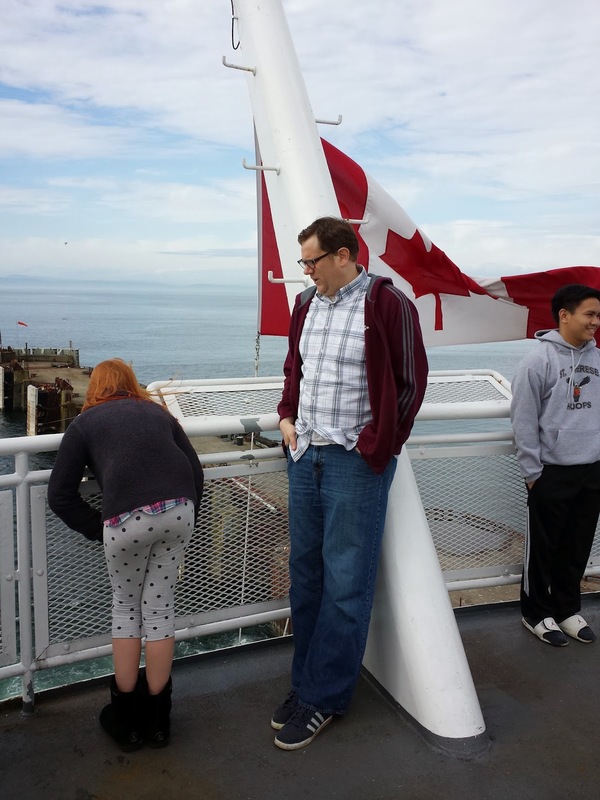 The ferry was so much fun. We were tickled by Canadian money and I spent a ridiculous amount of time on board figuring out the U.S. cost of things with the exchange rate. The boat snaked through a bunch of tiny islands on its way and the ride felt much shorter than it actually was. Matt and Iris on the ferry. Of course, we were welcomed to Tara's family's home with open arms. I almost immediately had a fancy espresso drink in my hand, courtesy of Tara's husband. It would be the first of many over the weekend! Then it was time to explore the area a bit. We ventured to a beach and chatted and searched for critters under rocks. Hooray for low tide! 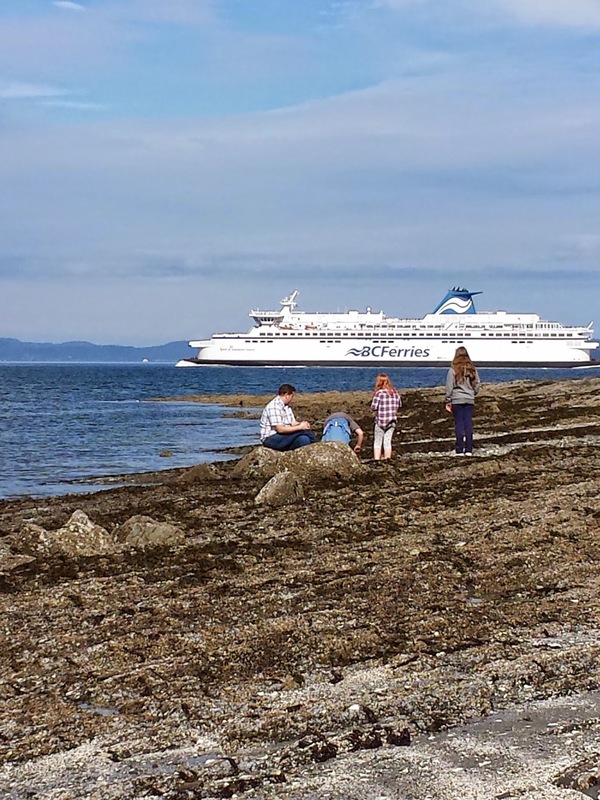 Exploring the beach as the ferry goes by! Soon it was time to head to dinner, Thai food!, and then a drive through Victoria with a stop for ice cream before heading back to our friends' house in the rain and heading to bed. Tara and I had a big morning planned! 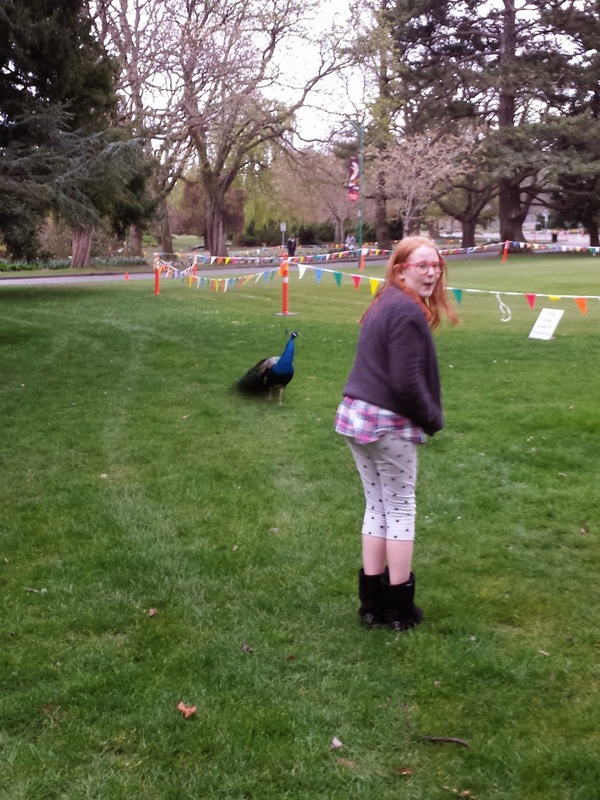 Iris hanging with a peacock in the park. We woke up semi-early to head out on a 16 (.75!) miler.. After the run Tara's husband had a never-ending supply of pizzas that were cooked on the grill, which were insanely delicious. I don't think I am exaggerating when I say I may not have ever eaten more pizza in my life. Post-long run hunger is no joke! After lunch we lounged, played games, then set out on an all-family walk. The area where they live is insanely beautiful. I would absolutely move there tomorrow if I could. Surely my husband can telecommute from Canada? Matt leading the kids on a game of "walk like me". After the walk is time for dinner-- homemade soup and foccacia. And after that? Movie time! With fresh popped popcorn-- half regular, half caramel corn. SO GOOD. And then time for bed. On Sunday morning we had a lazy time hanging out and playing video games and eating some of Tara's husband's homemade blueberry white chocolate chip scones. I keep bringing up the food because holy cow, it was amazing. I learned a few things, too, and hope to try some of their recipes at home! It is so fun to spend time with their family because we are all "evenly matched" moms, dads, big kids and younger kids. Usually that is how we all pair off on our shorter visits. This time we had more time to do some things all together, some things in small groups, and the kids got to each spend time with different kids doing different activities. We could have probably spent a week there (don't worry Tara, wouldn't actually do that to you!) and never run out of things to chat about. It is incredibly easy to get along with their family. Good friends, good food, good running, what more could you want out of a weekend? I can't wait to go back again!